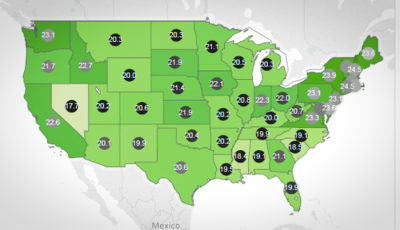 Alabama School Connection » How Do You Define and Measure Success in Your Neighborhood Schools? It’s simple to measure success on a football or baseball field. The higher the number of wins, the more successful the team, right? You win a trophy or a championship at the end of the season, and you know you’re successful. But how do you measure success in your neighborhood school? Your school district? The state of Alabama? Measuring success, heck, even defining success seems to be a challenge in this era of education reform. Most of us tend to focus on our own children, maybe our nieces and nephews, and hone in on whether they are being successful in school. But for those whom high grades prove problematic, it is our nature to seek other ways to show success. Like “hey, he might struggle in the classroom, but you should see him on the football field”. Or “she has never been much for tests, but she has a whole lot of friends and takes her role on the student council very seriously.” Success in school is not only defined by grades and test results. Years ago, I went through a mostly-futile exercise to put on paper my own thoughts on how I could consider my children successful in their respective schools. What I found was that those measures looked different for each of my three children. When I was a young mother, I thought that maybe grades and test scores were the most important because those grades and test scores were used to define my children’s academic reputation in school. Teachers seemed to place high importance on good grades and good test results, and I witnessed children being treated differently based on how they were perceived by their teachers (e.g., “lazy” as opposed to “motivated”). As my children progressed through the late elementary and middle school years, I began to wonder if those tests and grades were adequately measuring the success my children were having in school. Those were the early days of No Child Left Behind (NCLB) high-stakes, high-penalty-for-failure tests. I began to hear mostly-disparaging comments from educators and administrators about how these tests were too narrow of a measurement of success in our schools. Of course we know they are right. Tests and grades are narrow measurements. They measure results, not effort. Take a few minutes to read these comments by three nationally-prominent education reformers, Geoffrey Canada, Diane Ravitch, and Margaret Spellings about measuring performance. Measurements are getting a particularly bad rap these days. Current measurements are not seen as good indicators of what is going on in our classrooms, and we are struggling to find other, more useful measures. Why must we measure what’s happening in our schools? Public education is by far the costliest pursuit for the state of Alabama. Nearly $8 billion in federal, state, and local money was invested in public K-12 education last year. A similar amount is budgeted for this school year. A $5.77 billion state budget for Education was passed just last night. Public education accounts for 51% of all state expenditures. We need a way to measure the results of that money being spent. Alabama lawmakers put together a solid accountability bill in 1995, only to have it watered down and substantially changed by NCLB in 2002. Why Alabama decided that less was more is unclear, but the result is that we ended up with narrow accountability measures: results of annual standardized tests (often given months before the end of the instructional year), results of a multi-attempt high school graduation exam (which our state superintendent has called a “low bar”), and participation rate in testing in the grades where tests were given. Here’s a great primer on success in schools and how it may be defined (from California. Click through the whole 9.0 section to get the big picture.) 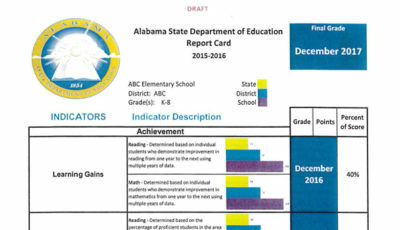 Here is the Alabama Education Report Card for 2010-2011. It’s got a whole lot of information in it, but does it really tell us anything about the level of success in our public schools? Not sure if you have seen the Balanced Scorecard approach to school management and measurements of success. It takes into account multiple measures as well. Here are Hoover City Schools’ 2010-2011 Balanced Scorecard results for Goal 1, which measures various achievement factors. Goal 2 has more of a focus on environmental and school culture factors. Here is Albertville City Schools’ Balanced Scorecard data, and here is their action plan for what to do with the data. And here is Mobile County Public Schools’ Balanced Scorecard information. With these Balanced Scorecards, you necessarily utilize multiple measures and set targets. You can logically infer that what is getting measured is what is the focus of the efforts of those employed by the school system. What is missing, in my opinion, is the evidence of continued community-wide buy-in, dissemination of the results, re-evaluation of the scorecard, re-alignment of goals of what is being measured in these Balanced Scorecards. It’s as if once the goals are set, the planning and evaluation process is over and results are just plugged in to the spreadsheet. That was never the intent of Balanced Scorecards. If your school system utilizes the Balanced Scorecard approach to strategic planning, take some time to find out how often the scorecard results are discussed and how it is updated to include possible new goals and directions for your school and school system. We now know that we need more than AYP to measure success. State Superintendent Dr. Tommy Bice and the State Board of Education (SBOE) have created Plan 2020. It includes a comprehensive system of measures on different fronts: students, teachers, and principals. While the SBOE has approved Plan 2020 as the state’s strategic plan, they are awaiting approval from the U.S. Department of Education to utilize it as a replacement for the NCLB Accountability provisions (Adequate Yearly Progress, or AYP). 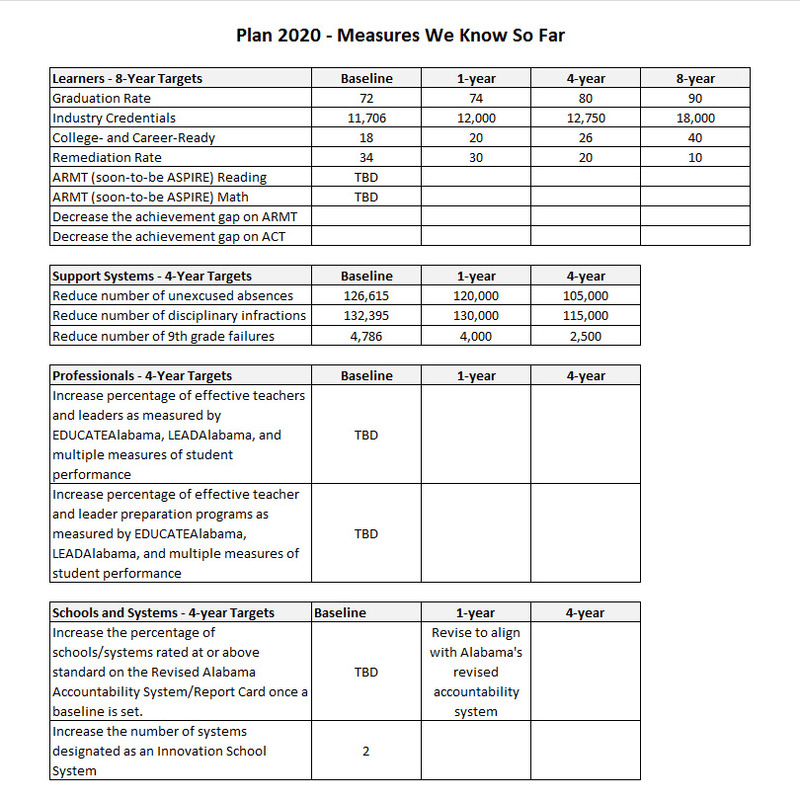 While I haven’t seen an official spreadsheet or scorecard of all of the measures, I attempted to put together one based on the ALSDE-published version of Plan 2020. Some targets appear to have been set, while others have yet to be determined. Numbers were provided for decreasing achievement gaps, but they didn’t make good sense to me, so I left them out of the chart below. You can click on the link to Plan 2020 to see the full document. So What Do You Think? Do These Things Measure Success? So all of these measurement systems are in place, but do they measure success? 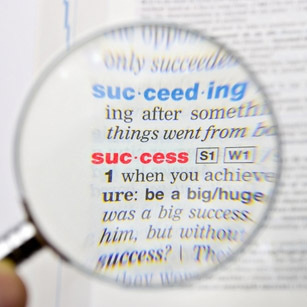 What does success mean to you? What does success mean to the other parents and families in your neighborhood school? How is success measured differently by families who are homeschooling or have placed their children in private school? Are your ideas about success all that different from other parents and families in your school community? Who has defined what success in the classroom means for your child? Did you have any say in the matter? Have you had that conversation with your child’s teachers and principal to ask them what they expect from your child in order to check the box that says “Successful” at the end of each school year? Knowing what target at which you’re aiming is very helpful. And in the absence of a community-built, community-defined measure of success, the education industry and the bureaucrats and legislators will step in and define success for us. Spend some time this summer talking with other parents and families in your child’s school about what what success means to your community and how you’d like to see it measured. If your child’s school is in sync with what you believe is important to success, then consider yourself fortunate and spread the good news. 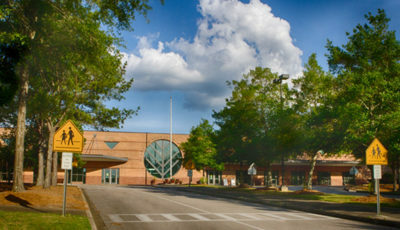 If your child’s school seems to place emphasis on things that don’t matter or has perhaps lost focus on educating the children in your community, strike up that conversation with other parents and families and maybe even a few teachers to figure out how to get back on track and headed toward success, the way your community defines it. As you read this, the ALSDE is working to develop a new report card and grading system for our public schools in Alabama. 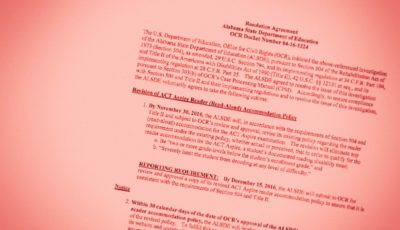 The first mandated deadline, December 31, 2012, appears to have come and gone and no update has been given on where the grading system stands. I have heard through the grapevine that an internal working group has developed a framework and at some point, parents and families are supposed to be invited to comment and provide input. While I eagerly await that opportunity, and will publicize it here when it happens, you, too, should consider stepping up when the time comes and providing your input. As always, please share your thoughts here or on the facebook page. This conversation needs to be had, and we parents and families need to be at the table.